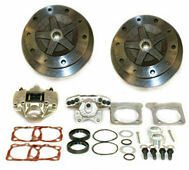 Wide 5 Rear Disc Brake Kits with 5/205 (Wide 5 Bolt Pattern) Rotors. Kits are without E-brakes. and come with: Rotors, Calipers, Pads, Mounting Brackets, Hardware, and Gaskets. Rotors are drilled for 12mm or 14mm studs (2 Patterns). Kits fit Short and Long Axle Bugs and Buggies. Comes with Spacer for axles on Long Axle applications. Axle Seal Kit included. Replacement Rotors are also available here. All early Swing Axle and all IRS. Click more info to choose your items.